Ann has taught throughout the country and spoken internationally on the development and training of search dog teams in both wilderness and disaster environments. She began training service dogs in 1975, when she became the first female park ranger in the State of Colorado. Co-founder of Front Range Rescue Dogs, Ann has also co-founded a park ranger service dog program, Search and Rescue Dogs of Colorado, and Search and Rescue Dogs of the United States. 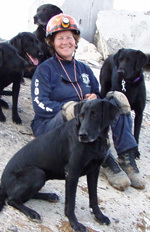 She served on the FEMA Canine Subcommittee from 1991 until 2004, helping to develop both the teaching curriculum and national standard for the Disaster Search Canine Readiness Program. 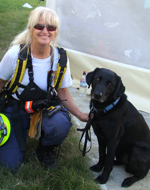 Ann is a chief evaluator and mentor for FEMA and an evaluator with Front Range Rescue Dogs. She is the owner and operator of Jenner’s Run. Teresa has a long history of search and rescue experience, specializing in Canine Search and Search Management since 1989. Her disciplines include Wilderness Search, Human Remains Detection, Water Search and Disaster Response. Teresa has responded to numerous missions on local, State, Federal and International levels. These deployments have included the OKC bombing of the Murrah building; hurricanes Katrina and Ike; the Bam, Iran, earthquake; the school collapse in Haiti; the Haiti earthquake; as well as responses to call-outs by the FBI, CIA, NCIS, and local law enforcement agencies. In addition to responding to search missions, Teresa has instructed and evaluated across the United States and has traveled to Istanbul, Turkey, Sao Paulo, Brazil, and the United Kingdom to assist in the education and evaluation of their search resources. Libby became interested in formally training dogs after she met her husband. She loved the challenge of trying to communicate such complex concepts and has extensively studied various methods of training and developed ways to improve the training to “fit” personal styles and individual dog’s style of communicating. 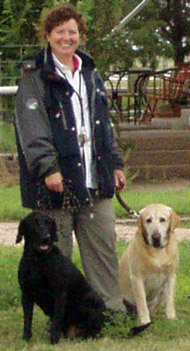 Libby has run AKC Field Trials and Hunt Tests, and UKC Hunt Tests, and is a UKC Hunt Test judge. She is also an active member of the Platte River Hunting Retriever Club. Libby is originally from Scottsdale, Arizona and is a graduate of the University of Nebraska. She has spent all of her life surrounded by dogs. Libby lives in North Platte, Nebraska with her husband Ron Green, who is a veterinarian. 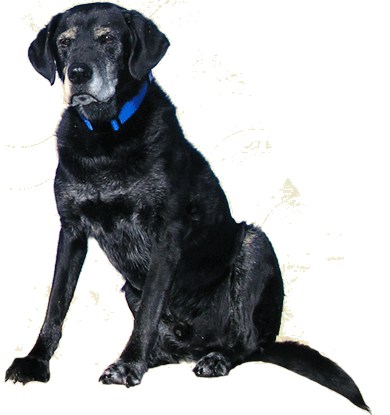 They raise and train American Field Labradors and own and manage a veterinarian clinic. Libby and Ron currently have 12 dogs — 10 Labs and 2 Jack Russell Terriers — and Libby can’t imagine a house without dog hair!